This article originally ran in Philadelphia Weekly on August 17, 2016. LaTreice Branson didn’t buy the drums she uses most. Among her few purchases is the Bumblebee, her yellow drum kit. But, on this Sunday afternoon, it sat disassembled in the front downstairs room of her Mantua house after a rare four-hour kit gig the night before. Upstairs in her living room, Branson sits on a couch surrounded by hanging tomato plants, artwork on the wall, cans of Play-doh on a shelf, and the hand percussion she plays much more often. The standouts are the Matador LP conga emblazoned with the Puerto Rican flag and solid-blue Patato LP conga with a handle. After that, there’s a paloma drum and two djembes. “Everything was given to me, and blessed into my life,” she explains. A member of her church had a djembe in her basement and gifted it to her. The paloma and other djembe, both from West Africa, came to her in a similar fashion: a fellow Philly drummer. She picked up the Matador from a pair of brothers who taught her about congas, and got its companion from a Latin drummer who traded it for some of Branson’s own artwork. But their journeys haven’t ended in Branson’s living room. Even just here, they’re used by her students: kids as young as four; women in their 40s; everyone in between. And, when they leave, they go to exciting places: Occasional pick-up gigs around the city, friends’ drum rooms, a political rally, even. But most often, they go every third Friday of the month to Dahlak Paradise, the Ethiopian restaurant, bar and hookah lounge at 47th and Baltimore in Cedar Park. Home to Drum Like a Lady, Branson’s jam sessions put female drummers front and center. The jam session, which she refers to as a collaborative nightlife scene, celebrates its one-year anniversary this Friday. It operates on a simple premise: Each one features a different female percussionist, while any other musicians can join in. The ladies get priority here, but other than that, it’s anything goes. It’s already attracted around two dozen professional female drummers, all from within the city limits, and often packs the room with listeners. There’s no set list or even songs, just free-form improv. Almost none of the musicians had met before sitting down together, but they play like they’ve known each other for decades. Despite playing in different lineups, at the least, there seems to be a common thread among the players at any given month. And, at the least, that thread is Branson herself, leading often with her bright blue, Puerto Rican-flagged congas. Maybe there’s another woman at the Bumblebee, and others on their own percussion or a second set. They explore funk grooves with adventurously broken-up, syncopated beats, or start out with basic patterns that sound miles away from rock, blues or jazz but are universal enough to be built up into these styles. Branson herself is a subtle torrent of tones and rhythms. At first blush, there’s not a lot of variation in her playing, but if shes one to stay put somewhere she’s also one to explore everything within reach. She pulls a wide variety of sounds from the congas, seemingly by just gliding her hands over the heads, and digs into polyrhythms – imagine the musical equivalent of counting your three and eight times tables simultaneously – without sacrificing groove. Branson connects her experience conducting the jams with the book The Music Lesson by renowned bassist Victor Wooten. Its subtitle, A Spiritual Search for Growth Through Music, is probably just as important. Before Branson held court at Dahlak Paradise, she taught photography and graphic design at The Ohio University, where she got her MFA, and later at Cheyney University in Philadelphia. Well before that, she learned to play drums from her mother, who had her daughter and friends practice rudiments on phone books before they could play her set. She developed ideas about tone: hitting the inside rather than the cover produced a different sound, for instance, as did turning to different pages. As passionate as she became, however, playing drums wasn’t much of a career option. Branson suffers from peripheral neuropathy, which manifests in numbness and pain in her feet and legs, and a disorder that allows her femur to dislocate easily into her pelvis. Even today, she has to spread out her performances to avoid over-exertion, and often leaves a venue walking with a cane. But drumming still influenced her career, where she would sometimes dramatically push herself across a classroom in a scooter for comedic effect. Her own exhibits often featured herself and other drummers. “I was trying to introduce the idea of musicians as fine artists, instead of the fine artist having to be separate from the musician,” Branson recalls. She moved back to Philadelphia in 2009, but other problems, like anxiety and bipolar disorder, came to a head at work and eventually cost Branson her job. As debilitating as that was, and as limiting as her physical capabilities can be, in their ways they essentially cleared the path for Drum Like a Lady to take form. “Now, when people ask me what I do, I tell them I run jam sessions,” she says. Not being able to keep a heavy schedule precludes Branson from bands or touring, but allows her to make connections with more people around her. 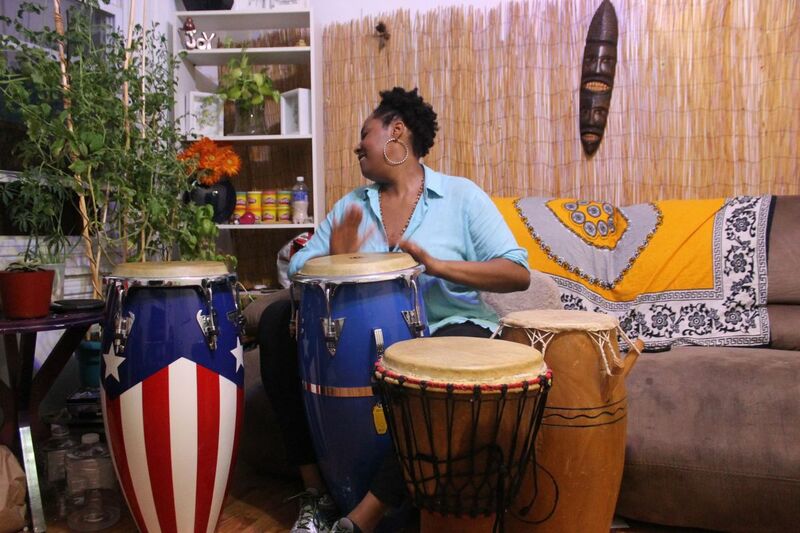 She has a network of friends and drummers, knows drum rooms she can go to almost anytime to jam, and keeps a third-floor room open at her home for fellow female drummers who need a place to teach. “If there’s ever a chance for a woman to teach, especially for another woman to drum, I don’t think they should ever have to sacrifice that because they don’t have a space,” she says. Her own lessons are as much about positivity as they are percussion, for herself and others. Now, she teaches people especially her younger, special-needs students, to feel their heartbeat before, during and after playing. It helps them understand how they can control their pace, and feelings, and it’s a strategy she formed herself, fusing music and therapy. Meanwhile, Drum Like a Lady continues to pick up. Branson gets invitations to special events, like when she was invited to open the Bernie Sanders rally at Temple University in April. For now she’s turning down invitations to take her show on the road – its an open-invite jam, not a band, and besides hours rehearsing or driving in a van won’t work for her. Still, Branson has her eye on bigger projects as the jam enters its second year, including work with new non-profit groups in the area. It’s all part of the same effort for her: the jam sessions, the lessons, the therapy and the outreach in general. “Sometimes, things happen that you could not plan yourself. Every successful thing I’ve done, they’ve happened because I’ve done something for someone else,” Branson says. Fri., August 19, 10pm. Free. Dahlak Paradise, 4708 Baltimore Ave.